It’s my favorite time of year. The mornings and evenings are cooling off; perfect for family walks, the house is trimmed with festive fall colors, and the kitchen is filled with the smell of spiced-baked goods. 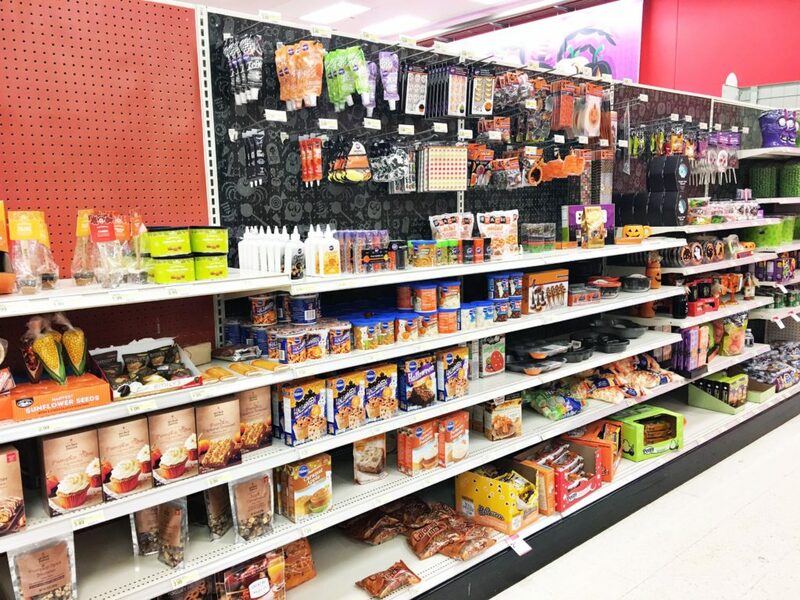 While the leaves aren’t changing here in Arizona we anticipate the start of Fall when the shelves turn to pumpkin everything! 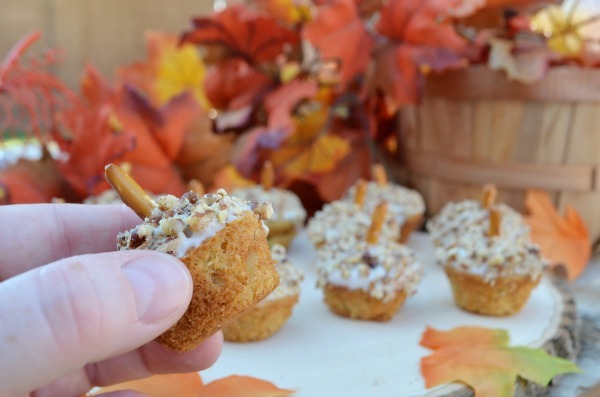 This year I experimented with making mini muffins with Pillsbury™ Moist Supreme® Perfectly Pumpkin Premium Cake Mix. And just for fun, and a little extra flavor, I dressed them up to look like acorns. 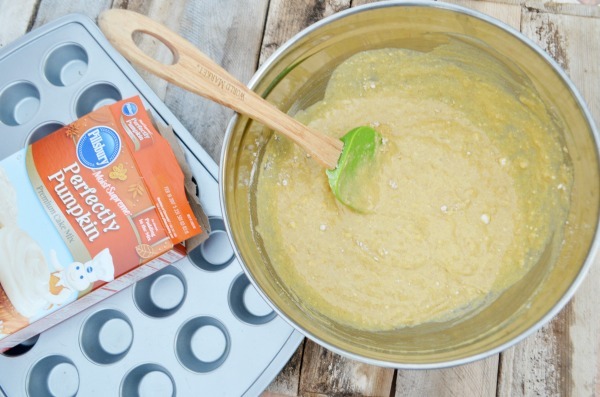 I love doctoring up boxed mixes to make delicious baked goods, it’s an easy and fun way to get creative in the kitchen. With a slight alteration of the ingredients the possibilities are endless. And, this year Pillsbury™ is helping me celebrate the season with delicious flavors like pumpkin spice and caramel apple. Mix water, eggs, and oil together in a large bowl. 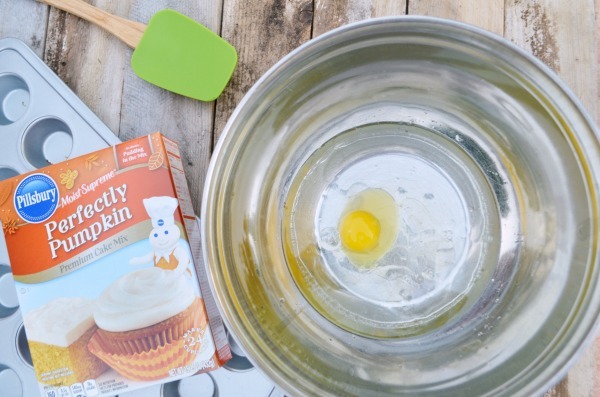 Add Pillsbury Moist Supreme Perfectly Pumpkin Premium Cake Mix, stir until most of the lumps are gone. Scoop small dollops into each mini muffin cavity. Bake 10-12 minutes or until a toothpick comes out clean. 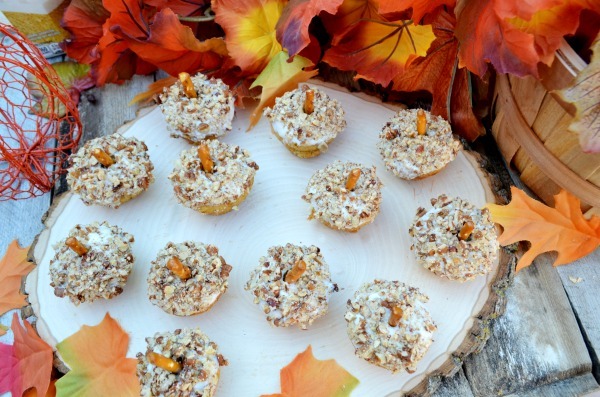 Cool muffins and set aside until you are ready to top. Chop pecans or nuts of choice until tiny chunks. Break pretzel sticks in half. Heat 1/3 c. Pillsbury™ Creamy Supreme® Cream Cheese Flavored Frosting in microwave for 15 seconds. 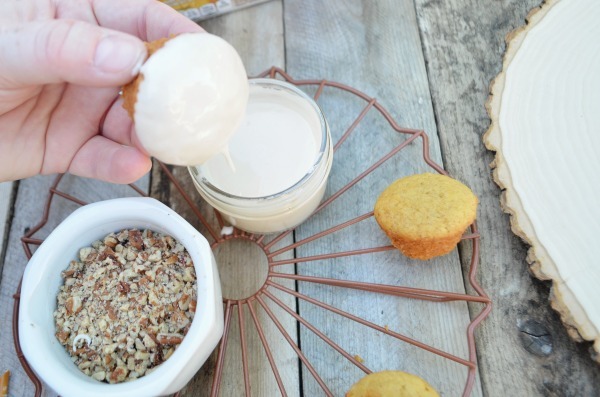 Dip the tops of each mini muffin into the cream cheese flavored frosting. 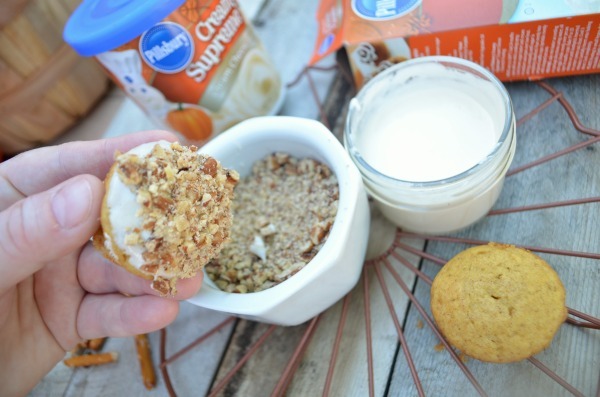 Let the extra frosting drip before dipping in the pecans. Place on serving platter and push half a pretzel stick into the top. Note, these muffins taste fantastic on their own, but turning them into little acorns just makes it more fun to eat! 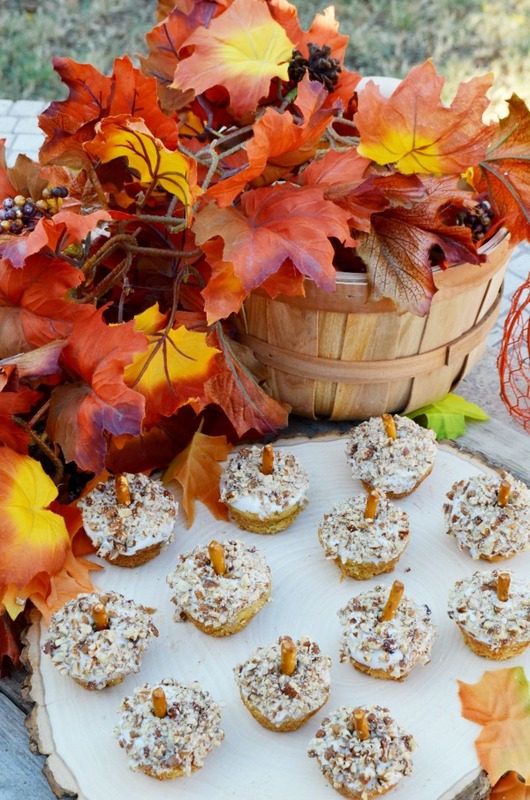 Deliciously spiced pumpkin mini muffins dressed up for the season to look like acorns. Preheat oven to 375°. 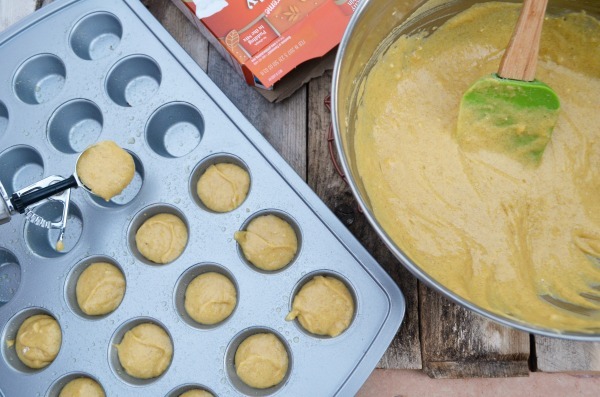 Prep mini muffin tin with oil. Mix together water, eggs, and oil in a large bowl. Incorporate Pillsbury™ Moist Supreme® Perfectly Pumpkin Premium Cake Mix into wet ingredients until most of the lumps are gone. Don't over mix. With a small cookie scoop place one dollop into each mini muffin cavity. Bake 10-12 minutes or until a toothpick comes out clean. 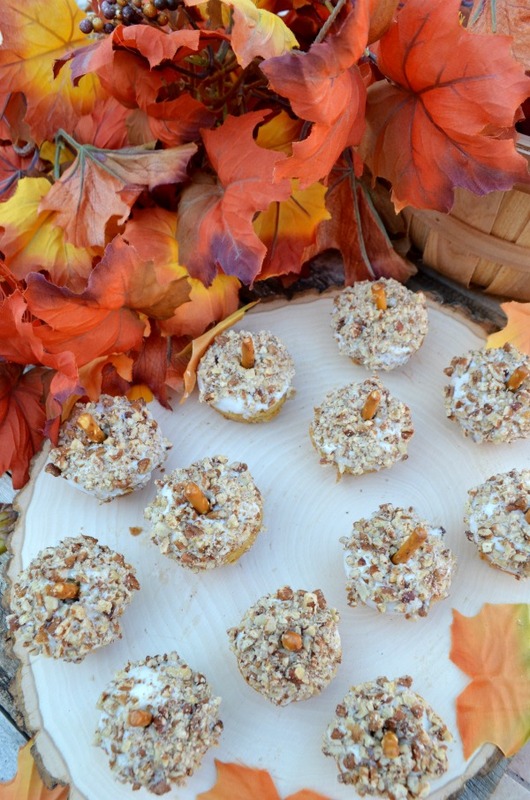 Cool muffins and set aside until you are ready to top. Heat ⅓ c. Pillsbury™ Creamy Supreme® Cream Cheese Flavored Frosting in microwave for 15 seconds. 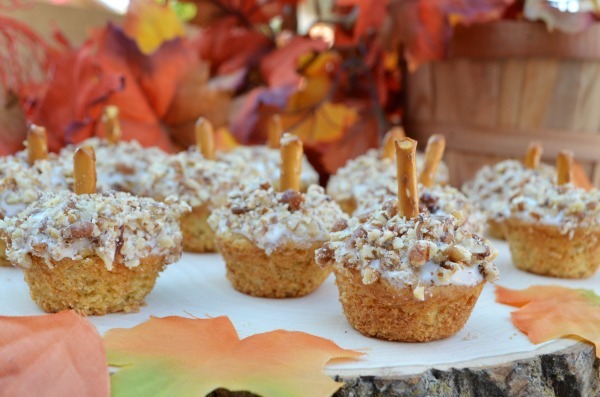 Dip the tops of each mini muffin into the cream cheese flavored frosting, then in the chopped pecans. 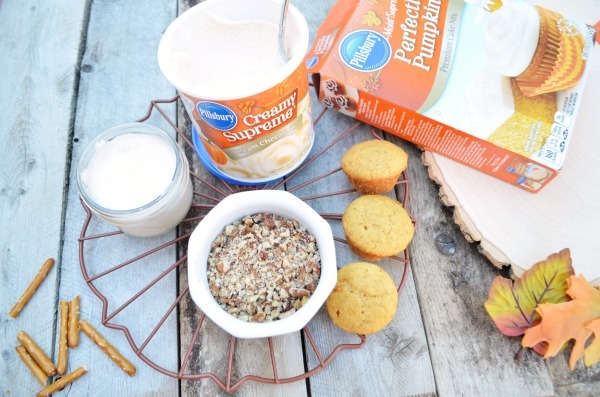 For a limited time you can grab Pillsbury™ mixes and frostings inspired by Fall at Target. 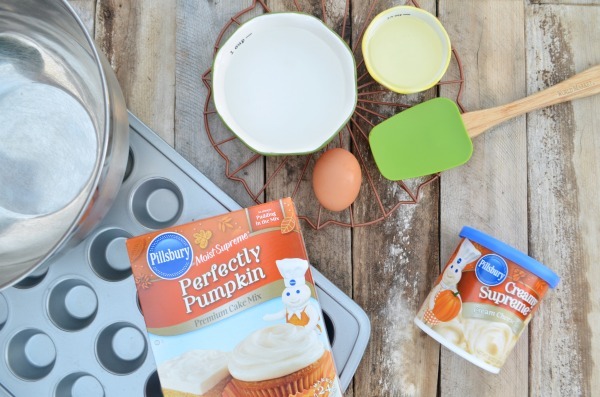 And be sure to checkout the Pillsbury™ Cartwheel to save 10% on baking mixes 9/25-10/22 (upcoming deal: 10/27-10/30).